True Blood Season 6 Premiere Party: What's on the Menu? Browse > Home / Arlene Fowler, Bill Compton, Characters, Lafayette Reynolds, News, Sam Merlotte, Season 6 News, Sookie Stackhouse, Supporting Characters, What's Cookin' / Blog article: True Blood Season 6 Premiere Party: What’s on the Menu? There are only a few days dragging by until June 16th and the Season 6 premiere of HBO’s True Blood. While #WaitingSucks, it also gives you the opportunity to get your premiere party sorted ahead of time. Normally I reserve gran’s pecan pie recipe for the finale, so I can cry along like Sookie (Anna Paquin) did in Season 1, but there are plenty of other ideas to whet every truebie’s appetite! True Blood Drinks & Bites is the newest recipe book on the market, but there is also True Blood: Eats, Drinks, and Bites from Bon Temps. NotQuiteNigella.com also offers a sumptuous spread that will moisten your creative juices. Heck, even Charlaine Harris offers a recipe for the infamous Chocolate Cake that Caroline Bellefleur makes for special occasions in the Southern Vampire Mysteries books (the series which inspired HBO’s True Blood.) You can find that recipe (along with several more) in Harris’ The Sookie Stackhouse Companion. While all these recipes are awesome, there are still plenty of creative ideas left to inspire your True Blood premiere party. 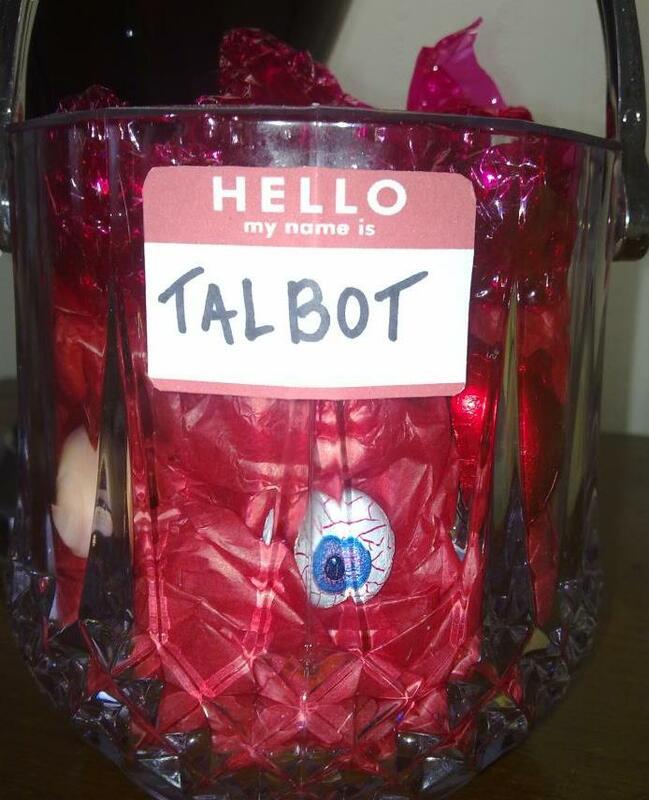 Why not use Talbot (Theo Alexander) as inspiration and make jello or fruit punch in a crystal candy jar? If you have any gummi body part treats or chocolate eyeballs left over from Halloween, even better. Speaking of Talbot – remember when he served blood as soup? Tomato soup would be great, but, as an alternative, why not try chilled beetroot soup? Layfayette (Nelsan Ellis) is known for his special burger recipe at Merlotte’s. While burgers are unwieldy at a party, why not make Lafayette meat balls? Dunking little wooden toothpicks in red food colouring (bloody stakes) completes the ensemble. Hot dogs dipped in plenty of tomato sauce (using more bloody stakes of course) – say hello to Billith! Of course, thanks to the emergence of all the fairies in Bon Temps in Season 5, why not serve the kindergarten classic: fairy bread? When thinking of True Blood inspired food, it’s a MUST to serve red velvet cupcakes. (Well that’s my excuse anyway!) But why not #ShowYourFangs and add some candy teeth to the top? Or, alternatively, try some bloody splatters of red food colouring thickened with corn syrup. Did you know that you can purchase food grade plastic syringes (without the needle top, of course)? These can be filled with Tru Blood jello shots and left in a bowl (or you can re-use Talbot if everyone has finished with the fruit punch). Did the jello shots make you thirsty? Well, the classic Tequila Sunrise goes perfectly with Arlene’s (Carrie Preston) hair. STILL thirsty? My fave Tru Blood cocktail involves Tru blood, vodka, triple sec and lemon juice. At Club Fangtasia, they call that a Plasmapolitan! Have you got any other suggestions? Let me know by commenting below! Sources: Rachel Tsoumbakos – TRUE BLOOD WEEK: What’s on Your Premiere Party Menu? Not Quite Nigella – A True Blood Dinner Party!